Team effort: The Mayo team celebrate after wining the league title in Croke Park. Photo: Sportsfile. Days like this don’t come around too often and when they do it is something to be savoured and the thousands of Mayo supporters who made yet another pilgrimage to Croke Park made drank up every moment of this one after the final whistle. But right until Ciaran Tracey slotted the ball under Shane Ryan four minutes into injury time the game could have in familiar heart-breaking fashion slipped through their fingers. Just as the game slipped into injury time Rob Hennelly pulled off a brilliant save from a David Clifford flick from close range that had Mayo supporters hearts in their mouths - but Hennelly held firm and Mayo cleared their lines. Not long after Tracey was played in and with the simple option to punch the ball over the bar and put Mayo two clear - the Ballina man showed the killer instinct to put the ball low and hard past Ryan and send the Mayo faithful into delirium. Diarmuid O’Connor picked up the man of-the-match award deservedly with his two brilliant second half points key moments in the game, but it was his goal six minutes from time that turned the contest in his sides favour after they had battled back from trailing by four points at the turn around. Kerry opened the scoring after 30 seconds through a Sean O’Shea free - the Kenmare man had been a star of the league all Spring, but the Mayo defence curtailed his influence from play handsomely. Jason Doherty should have levelled the game up in the fourth minute but he missed what looked like a simple free. Mayo levelled it up up through a Fergal Boland point on the six minute mark, when he could have went for goal but opted to fist it over. A minute later Donal Vaughan got in on goal, but his effort was well smothered by Ryan - Kerry missed a couple of decent chances to go back into the lead and Paddy Durcan put Mayo into the lead for the first time nine minutes in and three minutes later Matthew Ruane fisted over to put Mayo two clear. But less than 60 seconds later Kerry had the ball in the back of the net for the first time when Gavin Crowley was on hand to finish after a little bit of magic from David Clifford to keep the ball alive under pressure from two Mayo men. An unforced pick-up off the ground from Brendan Harrison on the quarter of an hour mark gave O’Shea a simple tap over free to have Kerry two clear and Clifford then showed his undoubted class to make it 1-3 to 0-3 on 17 minutes. Jason Doherty cut the gap back to two finishing off a well worked move involving Aidan O’Shea, Darren Coen and Diarmuid O’Connor ten minutes from the break - but right from the kick-out Kerry struck a dagger in the Mayo faithfuls hearts when Stephen O’Brien was on hand to make ti 2-3 to 0-4. 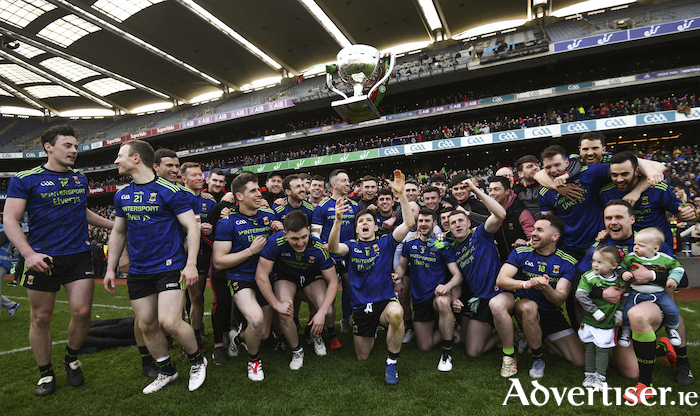 Mayo did manage to keep Kerry scoreless for the rest of the half and Boland tagged on a fifth point for Mayo before the change over, but they needed to hit the ground running in the second half it looked like, and they certainly did that. James Carr’s whose selection for his first ever start for Mayo was the main talking point before the game drove over a very fine score from play on 36 minutes and less than 60 seconds later he kicked his second of the day from a mark, showing great composure to slot it over from a tight angle. Darren Coen - another whose selection ahead of other more vaunted names made sure his day was going to at least end with a score with a nicely taken effort to cut the gap to just one point three minutes into the half. Sean O’Shea pushed that back out to two points from a free and then points from Gavin Crowley and another O’Shea free had Kerry leading 2-6 to 0-8 with 47 minutes gone and they looked to have weathered the early Mayo storm. Matthew Ruane - who had won the earlier meeting between the sides in Tralee back in the middle of March with his late goal, was about to hit the back of the net again and shift the momentum back in James Horan’s sides favour. Ruane was involved in Mayo winning the possession from a kick-out and played a one-two with Darren Coen before turning inside Jack Barry and finishing to the net to leave the score at 2-6 to 1-8 in favour of the Kingdom and it all to play for. Kerry edged two clear again through another O’Shea free soon after, but Mayo were really about to find their groove and Diarmuid O’Connor was going to take the game by the scruff of the neck. After a long period of keep ball by Mayo the ball was moved to O’Connor under the Hogan Stand and he drove the ball over the bar with the outside of his boot from distance. James Carr then got in for what looked like it might be a penalty, but referee Fergal Kelly waved away Mayo’s claims, Fergal Boland then hit a long range effort that bounced back off the post as Mayo tried to pull themselves level. The did just that with 14 minutes left on the clock through a close range Doherty free and a minute later O’Connor stepped up once again with a long range effort to put Mayo into a 1-11 to 2-7 lead and get the travelling faithful in full voice behind them. Jack Barry levelled it up with ten minutes to go - just after another O’Connor long ranger just dropped short of the target - but with six minutes to go he was about to have the decisive moment of the game. Paddy Durcan let fly with an undercooked effort for a point, O’Connor chased in after it and got there ahead of both Sean O’Shea and Shane Ryan to punch the ball to the back of the net from close range and have Mayo three clear and time on their side. But Kerry weren’t done yet and Paul Geaney pointed to close the gap to two just before the 70 minute mark and then Clifford almost got in for a goal only for Hennelly’s brilliant save. But he did slot over a point not long after to cut the gap to just one and with Aidan O’Shea off the field having picked up a second yellow - the numbers game was against them. But instead of trying to see out the clock Mayo kept going and Andy Moran picked out Ciaran Tracey on the overlap and the Ballina man kept his composure to kick Mayo’s third goal of the day and seal their first league title since 2001 and their first national final win in 11 attempts since then, failing to win their previous three league finals and seven All Ireland finals since that win over Galway 17 years ago. For the the old warriors like Andy Moran who was the last man up to lift the trophy, Keith Higgins, Kevin McLoughlin, Chris Barrett, Lee Keegan, Donal Vaughan and Aidan O’Shea - they have at least one national title in their back pocket - while for the likes of Matthew Ruane, James Carr, Fergal Boland and Diarmuid O’Connor the future could have many more of them in store.